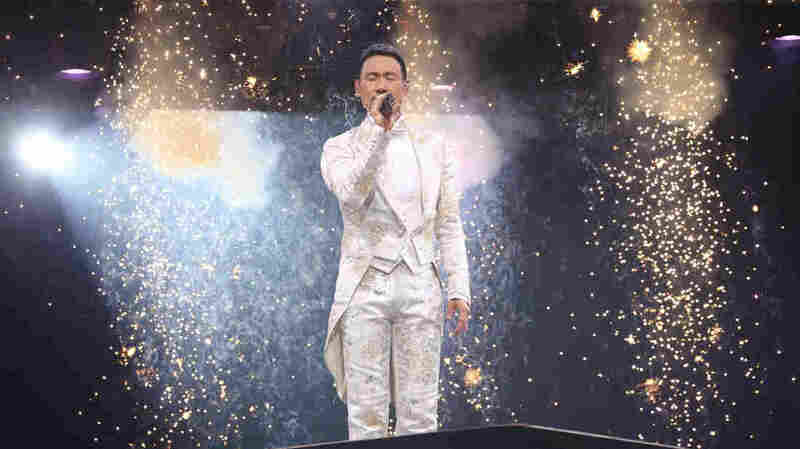 Thanks To AI, A 3rd Person Is Arrested Following A Pop Superstar's Concert : The Record The man was among some 20,000 people attending a Jacky Cheung concert when he was identified by facial recognition technology powered by artificial intelligence. Chinese superstar Jacky Cheung performs onstage during his "A Classical Tour" concert at Hong Kong Coliseum on Dec. 4, 2016. As people continue to feed more and more of their interior selves — our likes, dislikes, wants, needs, social cartographies — into digital networks that harvest and parse that information into profiles used to make money, a new frontier of monitoring that hones in on our physical features is ascendant. In Jiaxing, China, on Sunday evening, a man — one of some 20,000 people attending a concert by pop star Jacky Cheung — was arrested after being identified by an artificial intelligence-powered facial recognition system, which China built after announcing in 2015 that it was creating a facial database. "A few minutes after he passed through the security checkpoint, our system issued a warning that he was a wanted person," an official with the Nanhu District Public Security Bureau told the Qianjiang Evening News. The man, who authorities identified only by his surname, Yu, is accused of having stolen around $17,000 worth of potatoes in 2015. "Another fugitive listened to Jacky Cheung's concert and was arrested," Jiaxing Public Security posted on WeChat, the country's extremely popular social networking service. Authorities also documented Yu's processing through the local police department. Yu is the third person to be arrested under the same circumstances — as in, identified among tens of thousands at a Jacky Cheung concert. Earlier this month, a person named "Liu" was identified by Chinese authorities at a Cheung concert in Ganzhou, for alleged crimes not made public. In April, "Ao" was identified and arrested during a Cheung show in Nanchang. As NPR's Rob Schmitz reported in April, these facial recognition technologies are being developed and deployed in China at a lightning pace, and funded deeply by the government, with one company receiving about $1 billion from it. As Xie Yinan, vice president of Chinese AI company Megvii, told Schmitz: "We just provide the government the technology, and they do their job with it. Cameras are set in China at 2.8 meters above the ground. That means they won't be able to capture human faces. That's a rule. Chinese citizens know that, so they don't think about it too much." The state-run news agency Xinhua recently published at least two stories on the technology, touting its effectiveness and saying it can verify people's identities at airport security in less than one second. It's even reportedly been used to monitor students' attentiveness in class, the (also state-run) Global Times reported. "With the 'smart eye' in action, I'm more focused and don't dare fool around in class anymore," one student was quoted as saying. But concerns over the technology aren't limited to grade-school students and pop concert attendees in a country overseen by a perpetual president. Last fall, the Financial Times reported on the concerns of Tony Porter, the U.K.'s surveillance camera commissioner, over facial recognition technologies being used there. "We don't have transparency," Porter told FT, "and we don't have absolute confidence that the processes and databases being used are proportionate and legitimate." And just yesterday, the ACLU revealed that Amazon has been shopping its own facial recognition technology, Rekognition, to U.S. law enforcement. Documents obtained by the ACLU show Amazon even helped develop a mobile app for police to use in tandem with its facial recognition technology. And, coming full circle, Madison Square Garden has reportedly used the technology, while Ticketmaster is reportedly exploring it.